Junior suites have king size Epoc beds with Egyptian cotton bedding, these rooms have an archway leading through to a separate living, dining & writing space (with the exception of room 23; a generously sized room with light filled windows overlooking St Gile’s church), a bespoke leather writing desk & living area with access to the roof terrace. 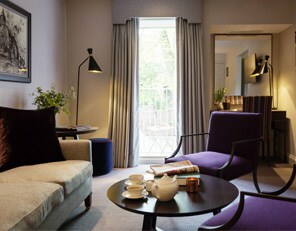 Our junior suites are individually designed using all natural fabrics; wool & velvet in rich shades of deep red, purple & grey with unique charcoal drawings of Oxford’s iconic buildings. Each room features your own Nespresso machine, treat filled mini bar with complimentary mineral water, fresh flowers, smart television, complimentary Wi-Fi access, Bluetooth DAB radio, air conditioning, safe & hair dryer. Marble bathrooms with either walk-in rainfall showers, shower over bath or standalone baths. Luxury amenities include steam demisting mirrors, underfloor heating, Noble Isle toiletries & linen bathrobes. "...cosy, characterful, warm and welcoming..."